Aureus liber Methaphisice divi Alberti Magni e[pisco]pi ratisponensis divisus in libros .xiii. Venetiis : p[er] Johanne[m] [et] Gregorium de Gregoriis, Mccccxciiii. die .xviii. decembris [18 December 1494]. Purchased by J.P. Morgan, Jr., 1919. Title from leaf a1r. Printed in red. Imprint from colophon (leaf [et]8r): Impressum Venetiis p[er] Johanne[m] [et] Gregorium de gregoriis fratres anno salutis. Mccccxciiii. die .xviii. decembris. Printed in types 26:110R, 27:75G, 28:106G, and 30:156G. Collation: a-z⁶ [et]⁸: 150 leaves. PML copy leaf dimensions: 30.1 x 20.3 cm. 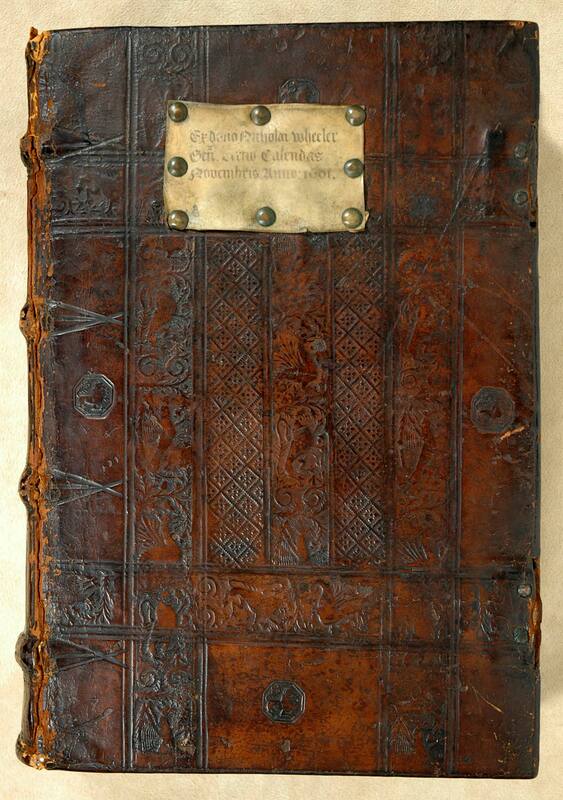 16th-century blind-rolled and -tooled brown calf over wooden boards (32 x 22 cm. ), sewn on 4 supports by Garrett Godfrey, Cambridge. Plain paper pastedowns and (modern) fly leaves. 2 clasps, missing. Hand decoration: Rubrication unrealized. Annotations: Fore-edge inscription: "II." Minimal marginal notations in text. Thomas Ashley, signature, early 16th century (leaf h8v of Tiene); George Brothers, signatures, early 16th century (leaf h8v of Tiene); purchase inscription: "Iste liber constat mr̄ā [??? ]," abraded (leaf h8v of Tiene); William Dussyng, inscription, early 16th: "Liber W. Dussyng" (a1r of Duns Scotus); Thomas Har, signature, 16th/17th century (leaf B8v of Duns Scotus); Nicholas Wheeler, donation inscription, 30 Oct. 1601: "Ex dono Nicholai Wheeler Gen. Tertio Caldendas Novembris Anno 1601" (top board label); J.P. Morgan, Jr. (1867-1943), purchased from Ellis, Sept. 1919.